I've been making a lot of Sushi cake , also I sometime make a large vegetable carving. When I make combination of both...Extreme Sushi Cake is born!! I made dragon with a lot of carrots. The Dragon sushi cake complete! I made tower with carrot. then made a wooden bridge with sweet potato, carps with vegetable ,made tortoise with cucumber...and settled them on the sushi cake..
Sushi cake of the Japanese garden complete! I made a carrots space needle for the memory of our lovely friend "Tsu-chan"
Here was an order of birthday present for the Korean idol "Doyeon"
I taught that bear and guitar are his favorite.. so I carved. one day, I had request ." 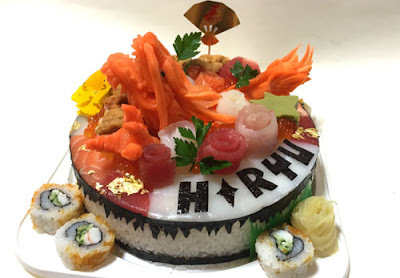 Could you make a sushi cake with Dinosaur?" So I changed my mind. 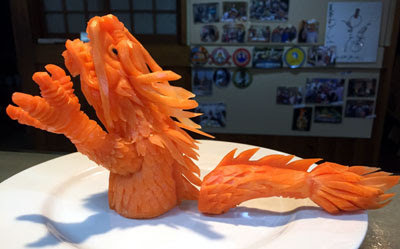 Well, Let's make Dinosaur with vegetable carving! Made a ｐteranodon with sweet potato. made a Mosasaurus with carrot. and I cut the "nori" into a shape of scallop and ammonite. make wasabi into the figure of the leaf. then decorate them together on the sushi cake. The Ｊｕｒａssic Sushi cake complete!